I'm curious about the "fully restored by Kino" comment - is MGM/UA in the habit of actually giving their film elements to others? I've always been told the answer to that is no. So, did they do the transfers in house and then Kino worked with those elsewhere? Genuinely curious. Since KINO had the films, I'd like to know if there were discrete audio tracks. Specifically a separate music channel. It would give some hope to soundtrack fans looking for unreleased music for the show. The sound on three recent Buena Vista titles put out by Kino was seriously bungled- Camp Nowhere is in mono when it should be matrixed stereo- the odd thing about that is Mill Creek already issued it a few years ago with the same problem! The Sixth Man and Celtic Pride should have 5.1 tracks, but those are also mono. Why would the masters even turn out like that? If that's how they were delivered from Buena Vista, they still should have been rejected by quality control as being flawed. Kino usually puts out great product but these were very disappointing. So you're saying that Arrow flew to the US and sat in on the scanning? Because MGM/UA would never let the negative out, especially to go overseas. Unfortunately Kino has a poor track record on this issue. Luckily those are three titles I’m not interested in. However two other titles I did buy were also erroneously mono: The Falcon and the Snowman and Taras Bulba . So, that I understand. It has to be scanned somewhere and Deluxe is a lab they use often. In other words, they didn't just hand someone the negative or ship it somewhere - they don't do that. That was my first point. My second point and/or question was/is was Arrow actually in the room for the scan? If not, then they did not "supervise" the scan. Grading and restoring are two completely different things and can be done anywhere by anyone, although I would, in this case, question the use of the word "restoration" at least if that word is to have any meaning whatsoever. They messed up Falcon and the Snowman too? That movie is essential in stereo, remember renting that on VHS Hi-Fi! Well I wouldn't have thought that Arrow (or whoever) needed to be there for the scanning, it's not exactly hands on, no big or artistic decisions to be made, except do it properly. Grading & restoration & finally, authoring, well that's an other matter entirely, LOTS of decisions to be made. well, my critique on Kino is that they should mind more their encoding, and I also think that they have wrong gamma settings in a lot of blurays. Comparisons with the corresponding Koch ones or others, show that the Kino are a tad too bright. Again, while Mr. White is very talented, he is not a film restoration person. That word is simply bandied about with total disregard for what it actually means. Mr. Harris is a film restoration person - that is NOT what Mr. White does because the films he's working on simply do not need what Mr. Harris does. I'm not certain what you hope to achieve here, but Mr. White saying he worked with original negative elements does not mean he was here when the transfer was done. It means the scan from original negative elements was sent to him and he did his work at that time. IMO, the blame for the misrepresentation is on Mr. White not this particular poster as Mr. White used some terminology in bold that is misleading to the layman which are most of us here. I do agree with you wholeheartedly that the terms "restoration" or "film restoration" are used incorrectly far too many times in trying to sell these video disc releases and in on-line discussions about them. Overseeing new restorations of both The Apartment and The Thing, two of my favourite films in any category, were certainly the two high points of the year for me. These were films I’d already seen countless times and presumed to know fairly intimately, but the experience of working with the original negative elements scene by scene and frame-by-frame continued to reveal new treasures. Ordinarily after I’ve completed a restoration it’ll be some time before I’ll want to watch the film again, but I could watch either of these any day of the week. Neither The Apartment or The Thing has aged one iota, and remain two of the most perfect movies ever made. Is it typical that KINO omits an episodes-disc list with TV shows? I thought it was a one-time oversight with OUTER LIMITS, but there's no list with THE MASTER series either. The disc tops say "Episodes 1-5" etc. which is useless. 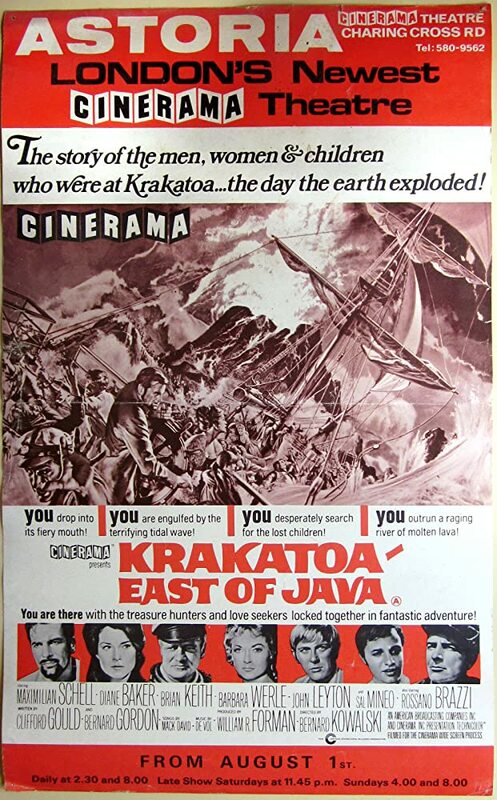 Disappointed that Custer of the West and Krakatoa East of Java only have mono sound. They were released in 70mm Cinerama with six track sound. I've been excited with the number of silent films Kino Lorber have been releasing on their Studio Classics line of late, mostly from the Paramount Library. Two W.C. Fields titles (IT'S THE OLD ARMY GAME, RUNNING WILD), 3 Gloria Swanson titles (ZAZA, MANHANDLED, and STAGE STRUCK; the latter with 2 strip Technicolor inserts), and THE COVERED WAGON. It's great to see these released at all, but Kino is going the distance with supplements, including audio commentaries, scores, and (in the case of the Swanson films) booklets. I'm sure they're not making anything on these releases, so it's nice to see them get released. Their recent Republic offerings have been amazing, especially the Trucolor restorations. I think the two serials they released were outstanding jobs (DAREDEVILS OF THE RED CIRCLE, ADVENTURES OF CAPTAIN MARVEL). I know they've said that no more serial releases are planned, but I hope they reconsider. Olive recently released THE VAMPIRE'S GHOST, but there are still a few Republic horror titles that I think genre fans would like to see out (especially THE LADY AND THE MONSTER 1944, the first version of "Donovan's Brain" directed by George Sherman, of all people!). Post is basically just a love letter to Kino for the boldness in some of their choices of late. You certainly can't describe their output as bland....there's something for everyone in their selections! Bert Greene, Darby67, B-ROLL and 4 others like this. I watched my Blu of Topaze tonight. Just before the end of the film (at 1:17:35, to be precise) the 4:3 image shrinks to a 4:3 image which does not reach the top nor bottom of my display's screen. It also develops rounded corners. This stays this way for a few seconds and then becomes a bit larger--but still with black bars on all four sides for the duration of the film (just another minute or two). All this happens just after Barrymore's character of Professor Topaze gives his final speech at his former school. It's an enjoyable film for many reasons (most of them being Barrymore & Loy)...but I thought it rather missed it's overall thematic marks. who keeps turning to the person next to him or her and saying "What was that?" over and over. As always, what does Kino have against English subtitles? The cost of providing them?